Now before I get to the actual case I want to make sure that you realize that a radicular/periapical cyst is diagnosed with a histopathological slide and not by radiographs alone. There are certain features of a radicular/periapical cyst that may cause you to put it higher on a differential list but this is why I choose to use the term rarefying osteitis instead as it encompasses three entities that have very similar radiographic findings. This case involves a maxillary central incisor. 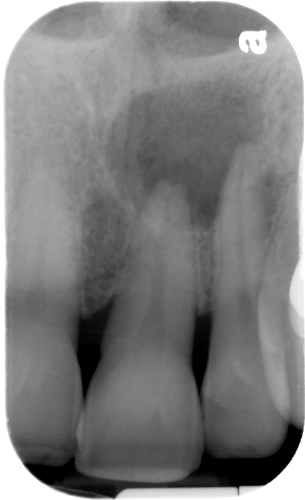 Note the well-defined radiolucent area at the apex of the tooth. If you follow the periodontal ligament space closely you will see it is not intact around the entire tooth indicating the radiolucent area is due to odontogenic origin. This case was confirmed with histopathological slides as a radicular/periapical cyst. If you have any questions or comments about radicular/periapical cysts, please leave them below. Thanks and enjoy! So if the peridontal ligament space was intact around the tooth, it would be called non-odontogenic cyst? How would you name that type of cyst? For this specific case, if the periodontal ligament space was intact due to the location, a nasopalatine canal cyst (non-odontogenic cyst) should be considered on top of a differential list.